Summer is the prime time for a Santa Barbara star party. The nights are usually cool and pleasant, and the skies are often clear and steady. 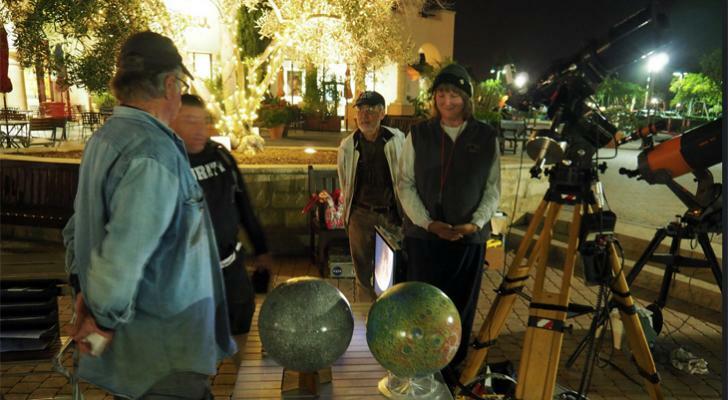 The friendly amateur astronomers of the Santa Barbara Astronomical Unit hold numerous public events where you can indulge your need for a deeper look into the Universe. Unless otherwise noted, all of these events are free. There are three primary SBAU public star parties that are held every month, all year, weather permitting. The SBAU is sponsored by the Santa Barbara Museum of Natural History, so our premier event is the SBMNH Monthly Public Star Party, held on the second Saturday of each month at their Palmer Observatory. Telescopes run by SBAU members are set up along the pathway leading from the museum parking lot to the observatory. There are also some telescopes set up in the circular observing pit adjacent to Palmer Observatory. Inside the observatory is a 20-inch Ritchey-Chrétien telescope on a computerized mounting. On the third Friday of every month, it’s time for the Public Telescope Night at the Keck Observatory, at the Westmont College campus, next to the baseball field. The observatory houses a 24-inch Ritchey-Chrétien telescope on a massive computerized mounting. Students there use it to study asteroid light curves and cataclysmic variable stars, but we just use it for fun. In addition, SBAU members set up smaller scopes in the observatory plaza and upstairs deck. On the first Tuesday of each month (for 2017), we set up for Telescope Tuesday at the Camino Real Marketplace, in the plaza next to the Food Court and theater. This site has a lot of nighttime lighting, so we change the monthly Tuesday each year to make sure we usually have a good Moon phase to show. But, depending on the movies and restaurant specials, we also reach a lot of people. For the summer, since we’re not busy with school science nights, we also bring star parties regularly to Cachuma Lake, Refugio State Beach, and Carpinteria State Beach. At Cachuma, the events are free for campers, but an entry fee is charged per vehicle to the general public. To kick off the star party, we have an astronomy slide show in their Fireside Theater. Following that presentation, everyone heads out to the line of telescopes in the field at Dakota Plains. Aside from some campfires and Coleman lanterns, the skies are pretty dark. We have similar events at Carpinteria State Beach, with a slideshow in their Campfire Center and telescopes set up on the sidewalk toward the beach from their entry kiosk. At the Refugio State Beach star parties, we set up in the southwest end of the day-use parking lot. This is a site where we consistently see excellent observing conditions, despite the proximity of the ocean. In summary, if you want to learn about, or just look at and enjoy, the Universe we live in, come on out to a star party! The SBAU is part of the NASA/JPL/Astronomical Society of the Pacific organization known as the Night Sky Network. If you’re not in Santa Barbara, you can enter your location in their website widget to find star parties and astronomy clubs throughout the USA. Images courtesy of Tom Totton and other AU members.